I am a member of the horse family and was domesticated more than 5,000 years ago. There are 40 million of us all over the world and we have a hard life doing work for our owners such as ploughing fields so that they can lead better lives. I am well known to be a stubborn animal and in fact I am harder to control than even a horse if I become afraid. However, once you have my trust, I can be quite playful and friendly but don’t mistake that for me being a pushover! Donkey’s were first domesticated most likely in either Egypt or Mesopotamia probably around 3000 BC. 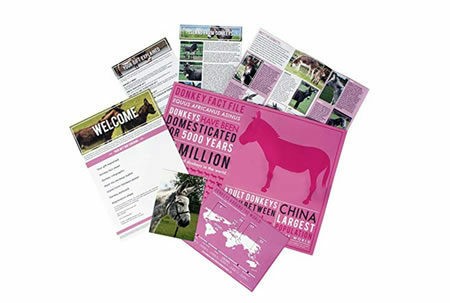 Since first being domesticated donkey’s have spread all over the world. They play an important role helping people to survive who live at subsistence level. Domesticated donkeys’ numbers continue to rise though an increasing number of them suffer from neglect or have been abandoned and need help. Donkeys have worked with humans for thousands of years and have helped people lead better lives. Donkeys continue to play an important role to this day helping the world’s most vulnerable people feed themselves and their families. Adopting a donkey for someone you care about is a great gift idea. The photo of your adopted donkey will serve as a reminder that you have helped a neglected animal. Donkeys appear to be quite intelligent, cautious, friendly, playful, and eager to learn. 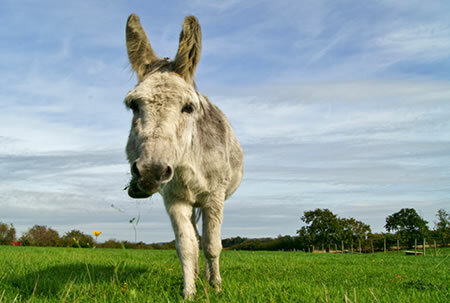 Most of the 40 million global population of donkeys live in the developing world. A working donkey in the poorest countries lives for about 15 years whilst in the developed world donkeys can live for up to 50 years. Donkeys have large ears, which may pick up more distant sounds, and may help cool the donkey’s blood. Whilst donkeys are famous for their stubbornness, this trait is actually a form of self-preservation because they have a stronger prey instinct and weaker connection with humans than horses do.